Biking has been a major part of our lives for over 25 years. Inevitably there have been many different bikes during that time. Some were excellent choices at the time we bought them, some less so! While we inevitably feel nostalgic about some of the bikes we've sold on, we're both very happy with the bikes we currently own. And, as there isn't enough room in our garage for any more bikes, it's probably for the best that they've gone on to new owners and, in some cases, to the great breaker in the sky! Anyway, here's our virtual garage where we can still find room for all the bikes we've ever owned. Everybody say aah! 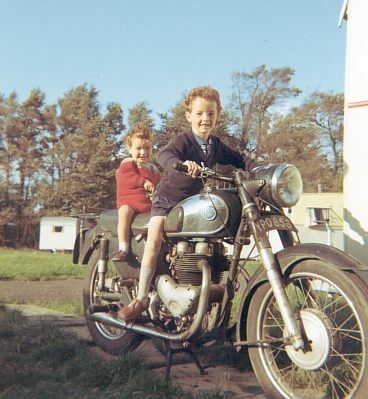 This was one of Andy's early encounters with a bike, on his uncle's AJS some time in the mid-60s. That's his kid brother on the back by the way. Andy got his first bike in 1979. What can one say about a Honda CD175, except that it has two wheels, an engine and was both affordable and learner-legal. A couple of weeks after Andy passed his bike test we signed our lives away to buy his first proper bike—a Kawasaki Z550. Note the aftermarket Marzocchi shocks in this picture, which was taken on the west coast of Ireland. 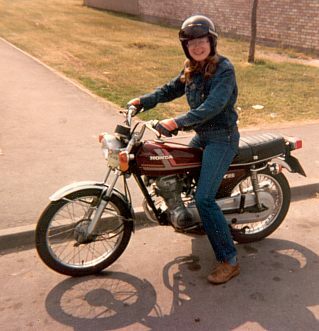 By early 1982 Janet had decided that riding pillion wasn't enough (whether this had anything to do with Andy's riding is a point we won't discuss here). 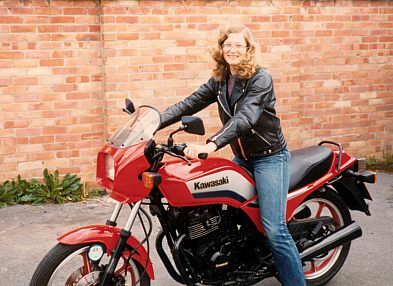 By 1982 the laws governing learner riders were on the verge of changing, and Janet took and passed her test less than four months after first starting out, in order to avoid having to take two separate tests. 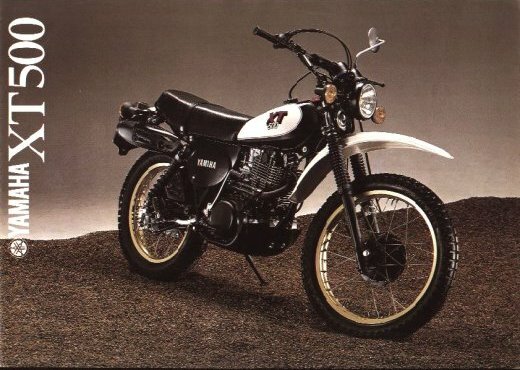 This is the Honda CG125 she learned on—nothing special, but a good introduction to biking. Andy traded his Z550 in against an XT500. It probably says something about the XT500 experience that it's the only bike we've ever owned that we don't have a single picture of. It came, brand new, with a porous crankcase as standard! This necessitated a full rebuild at a small bike dealership within days of buying it, and it never quite seemed to settle afterwards. It did have its redeeming features, though it was hard to recognise them at the time. After the disappointments of the XT500 a trustworthy BMW seemed like a good bet. 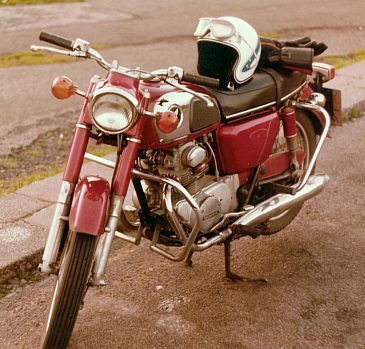 The R80/7 was one of the very few bikes we didn't buy new, but it was just nicely run in and was a dependable commuter and tourer. Unfortunately it had to be sold when Andy needed his first car. 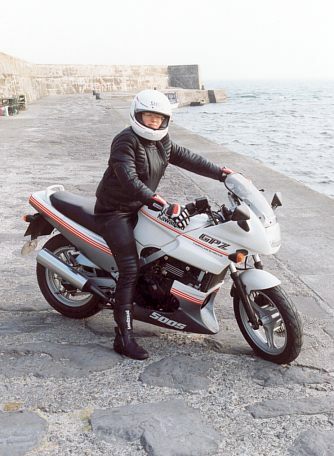 Meanwhile Janet moved on to a KH250. It was a charismatic bike, but it was a little too large and heavy for Janet's size and experience at the time, and she dropped it at a standstill regularly enough to dent her confidence. It was also somewhat unreliable, and getting it fixed was difficult with a dealer who didn't take lady bikers seriously. By the time this picture was taken Andy had inherited it and added the low bars, rearsets and loud pipes! Buying another Kawasaki from the same dealer was a bad move with hindsight, but the GPZ305 should have been more reliable. Actually it went back to the dealers about 20 times (yes really!) during the first year of ownership. After that Janet sold it and thought she'd just about had it with biking. Once a biker, always a biker. 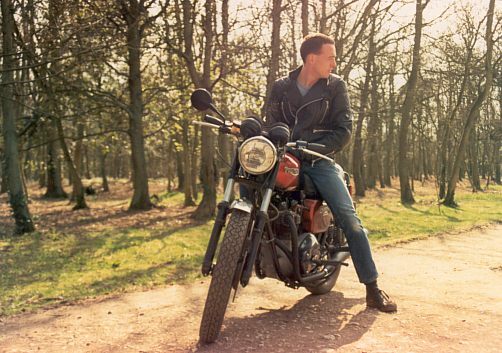 About 18 months after selling the BMW, Andy bought a second-hand Triumph Thunderbird. It seized about three weeks later, at about the ton, two-up. The subsequent strip down and rebuild showed that neglect by the previous owner was the most likely cause. 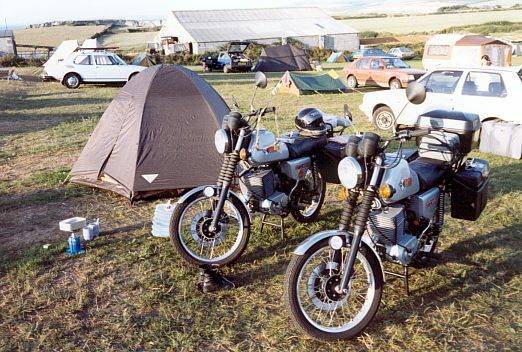 It was a very rewarding project to completely rebuild the Triumph, and it ran very sweetly afterwards. However, that was the last second-hand bike we ever bought! While the Triumph was still being rebuilt Janet decided that she wanted another bike. 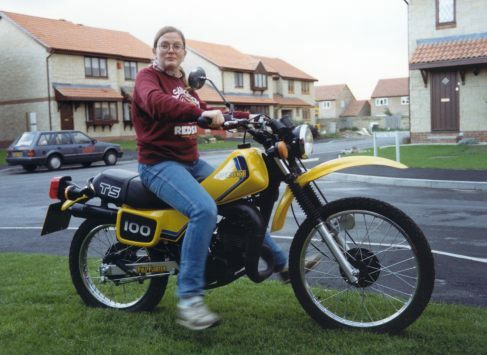 She opted for an MZ ETZ250—a very basic East German two-stroke. 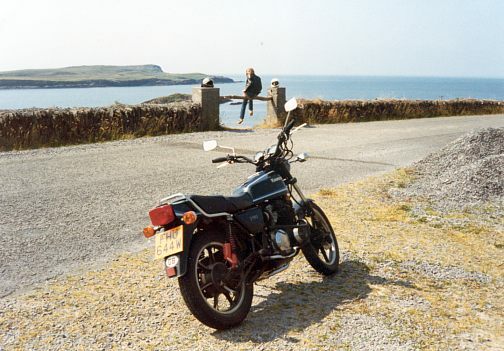 It was a really good move, as it was a great bike for commuting and touring—Janet's first trips to the Isle of Man TT Races and to mainland Europe were done on the MZ. And when it broke down even a girlie could usually fix it by the roadside. 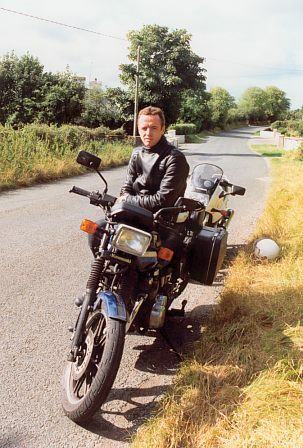 It proved to be such a good tourer that Andy bought an identical one for touring use, even though his Triumph was back on the road by then. Ever since selling the XT500 Andy had fancied trying a bit more off-roading. 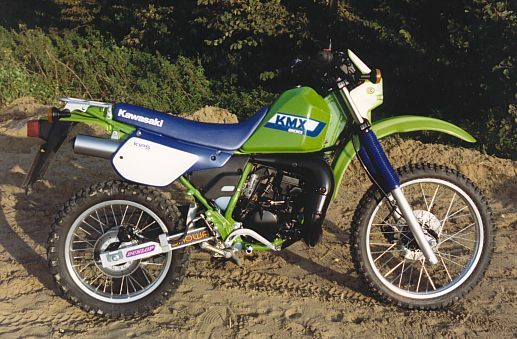 So he bought a KMX200 and squeezed it into the garage with the two MZs. Janet wanted to be able to enjoy some off-road fun too, but was severely limited by her lack of height. She settled on a TS100ER, and squeezed it into the garage with the two MZs and the KMX200! Finally Janet was ready to move on to her first middleweight. Touring round Germany on the MZ had been fun, but it was clear that more power would actually make things a lot safer. 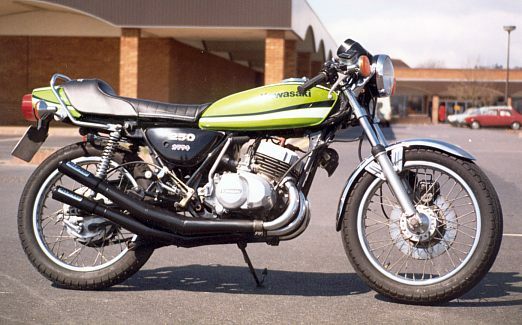 The GPZ500 came from a local Kawasaki dealer (not the one she'd used before) who knew how to treat lady bikers. In a little under three years it took her to the TT races, Berlin, the Bristol Royal Infirmary (with a badly broken ankle and wrist—not Janet's fault) and Ireland (in that order). It covered about 14,000 miles in that three years. 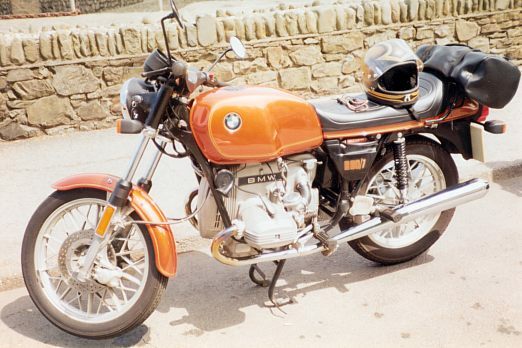 Andy was now playing catch up as he still only had his MZ and his KMX200. He obviously needed a bigger bike to match the GPZ500 for touring. He bought a GT550. It was a good workhorse and, apart from a bit of excessive oil consumption, was reliable. But at the end of the day, for his experience level, it was a little uninspiring.